Put the sauteed onions, celery and garlic into a large mixing bowl with the thawed okra along with 1/2 tp each salt, pepper, garlic powder, onion powder and 1/4 tsp each crushed fennel seed, basil, tarragon, curry powder along with one beaten egg. At this point, if you are a cheese eater you could add up to 1 cup of shredded cheese. For a full fat version, you could add 2 tablespoons of olive oil or mayo, which would also add flavor. Add panko and/or regular Italian seasoned bread crumbs and mix until it becomes an almost doughy consistency. Spray the bottom of a 9″ round pan and squeeze the mixture very flat into the bottom of the pan. The flatter it is, the more crispy it will be. Into a preheated 425f oven for maybe 15-20 minutes. It will turn out very crispy on top and bottom and slightly soft in the center. Cut into strips or pie slices and serve with your favorite hot sauce or dipping sauce. 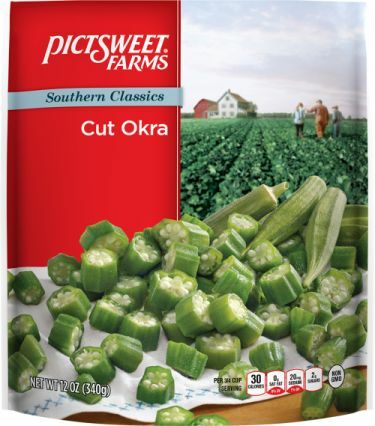 You could also make this recipe adding or substituting steamed eggplant or artichoke hearts for the okra. First, saute in olive oil one big chopped onion along with 2 chopped celery stalks and a few chopped garlic cloves if you have them. Once they are golden they’ll add great flavor to this dish. Put the sauteed onions, celery and garlic into a large mixing bowl with the thawed okra along with 1/2 tp each salt, pepper, garlic powder, onion powder and 1/4 tsp each crushed fennel seed, basil, tarragon, curry powder along with one beaten egg. You can add an extra egg if you like. Spray the bottom of a cookie sheet with Pam. Make palm sized burgers about 3/4″ thick. Place them onto the cookie sheet, sides not touching because we want them to get crisp on the sides also. Into a preheated 425f oven for 12 – 15 minutes. They will turn out very crispy on top and bottom, soft and chewy in the center. Serve on toasted buns with a good mustard along with lettuce, tomato, onion and pickle. 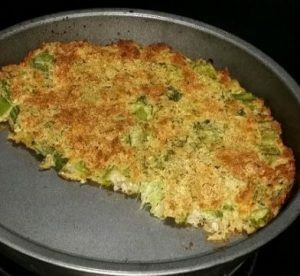 It packs a great crunch/tender texture for a veggie burger. 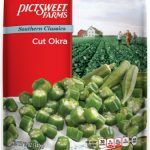 You could also make this recipe adding or substituting steamed eggplant or artichoke hearts for the okra. I especially like them made with eggplant. The celery is an important flavor component.